Siasun Robot and Automation Co., Ltd., China's leading robot manufacturer, on Wednesday opened an industrial park in Shenyang, capital of northeast China's Liaoning Province. With a total investment of nearly 2 billion yuan (US$302 million), the industrial park covers an area of 260,000 square meters, or the size of 36 soccer fields, in Shenyang's Hunnan New Area. Construction of the park took more than five years. It includes an office building, a robot demonstration center, a research and development center and manufacturing centers for digital equipment and large machinery. 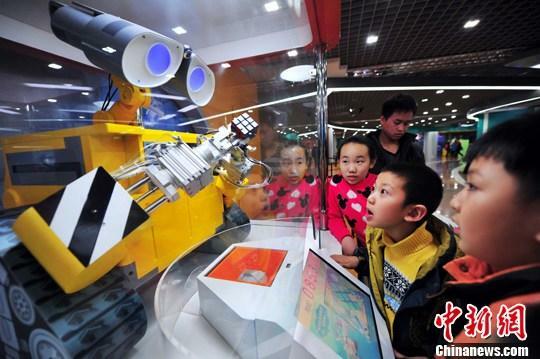 It also has a digital intelligent factory, the first demonstration manufacturing project for China's Industry 4.0, which combines robots, intelligent equipment and information technology into the manufacturing process. With robots manufacturing robots, the factory is designed to reach an annual production capacity of 10,000 robots and intelligent manufacturing equipment units, said Qu Daokui, founder of Siasun. Listed in Shenzhen, Siasun is China's leading robot maker with a research and development team of over 2,000 people. Siasun Robot and Automation Co., Ltd., China's leading robot manufacturer, on Wednesday opened an industrial park in Shenyang, Liaoning Province.